Localise, the consumer profiling arm of DJS Research Ltd, today released figures which suggest wide-spread dissatisfaction among UK residents in relation to the way in which local councils target their services and spending, and the extent to which councils understand the position of local residents. Only around a quarter of people, from a UK-wide poll of 1,034, actively agreed (i.e. ‘agree strongly’ or ‘agree’) that their council had a good understanding of its residents, compared to nearly two-fifths (37%) who actively disagreed with the statement. This is particularly true in Wales and Northern Ireland, where around half actively disagreed with the statement (49% and 48% respectively). Similarly, when asked to what extent they agreed with the statement that their local council targeted services in a way which best suited them, only a fifth of residents said that they actively agreed, with more than double that actively disagreeing (43%) and within that more than one in ten strongly disagreeing with the statement (13%). Only around a tenth of 15-24 year olds actively agreed with the statement. Residents were also asked about their perceptions of how councils spent their budgets. Again, when asked to indicate their agreement with the statement ‘My local Council focuses its budget on the services which matter most to local people,’ fewer than a quarter agreed (23%) – with only 3% strongly agreeing. This statement also had the highest level of ‘strong disagreement’, with almost one in six (14%) choosing that option. Overall, two fifths (39%) disagreed with the statement. Agreement with the statement was particularly low in Wales and Northern Ireland, with just 12% and 10% net agreement respectively. 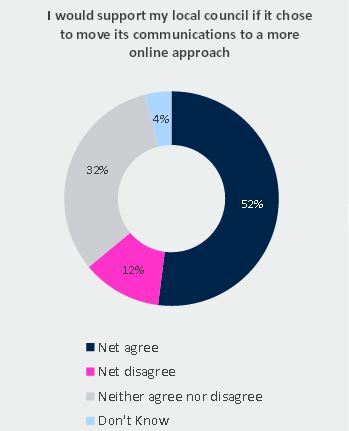 The same piece of research from Localise also found that residents across the UK would generally support (52% net agree, 8% net disagree) councils moving their communications channels to a more online approach if savings made could then be applied to other areas. Those aged over 65 were the only group in terms of age where net agreement dropped below half (48%). Verbatim comments provided as part of the survey also outline these facts, with issues around a lack of Council information appearing regularly. You can download the full report from the DJS Research Ltd website, or below, or call Alasdair Gleed directly on 01663 767 857. Subscribe to receive email updates of news and articles.